Although I am personally not a fan of the trendy ‘Instagram brow’, I love the look of well-groomed and defined eyebrows. Messy eyebrows can throw off the entire look, so I try to put in at least a little effort into them, even if I am in a rush or feeling lazy. That probably explains why I had so many brow products to start with. Hourglass Arch Brow Sculpting Eyebrow Pencil in Warm Blonde & Soft Brunette* ($34) – I really like these brow pencils. The formula is a little stiff and not super pigmented, which makes it easy to control the color intensity. I also love the big spoolie brush at the ends, it’s the perfect size! European Wax Center Oh My Brow! Brow Highlighter* ($19) – This highlighter comes in one universally flattering shade that looks great on all complexions. It adds a little bit of shimmer under the brow bone to make the brows look extra great. AFAIK you can only buy these at European Wax Center lotations. 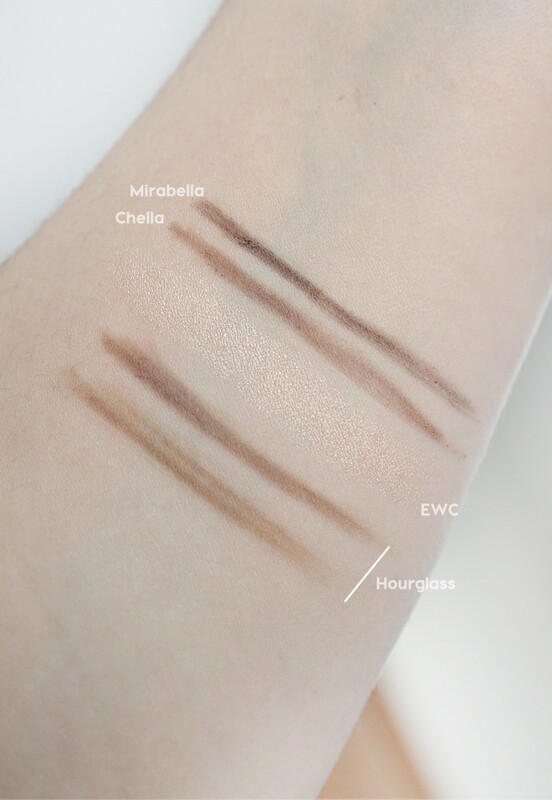 Chella Eyebrow Pencil in Tantalizing Taupe* ($18) – This Chella pencil has been in my collection so long that i don’t even remember if I like it anymore. The color is nice and looks kinda similar to Hourglass Soft Brunette, but I don’t think I should be using it if I don’t even remember its origins. 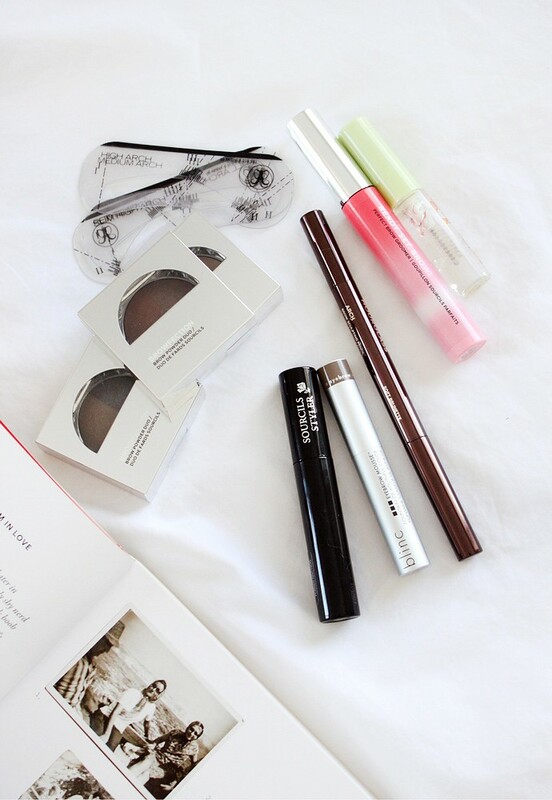 Mirabella The Brow Pencil in Dark* ($21) – This used to be my go-to brow pencil until I discovered Hourglass ones. Mirabella is a professional makeup brand that is usually distributed via beauty salons and SPAs, and all of the products I tried from them were great. The main thing about these pencils is how thin they are, so you can easily draw little hairs that will look like the real ones. Also, it didn’t seem to melt off easily even in humid weather. 100% Pure Green Tea Fiber Brow Builder in Medium Brown* ($22) – This brow gel is amazing, and it’s also all-natural. It contains tiny fibers that adhere to the eyebrows making them look thicker and bolder, and it stays on all day without melting off. I am so sad to toss it, but I’ve been using this gel religiously for many months now. I would definitely recommend giving it a try. European Wax Center Ready. Set. Brow! Perfect Brow Groomer* ($19) – I love this clear brow groomer, it really sets my unruly brows in place and actually holds them there for most of the day. These are only available at EWC locations. PIXI Brow Tamer* ($10) – A drugstore alternative to the brow groomer above, this clear gel also works as a colorless mascara if you fancy that for a no-makeup day. I really like this one as well. Anastasia Beverly Hills Clear Brow Gel ($22) – This clear brow gel has almost a cult following, but I didn’t find it to be any better than the two products I mentioned above. It’s a nice product indeed, but I probably wouldn’t pay premium for it. blinc Eyebrow Mousse in Light Brunette* ($24) – This unique tubing formula is resistant to smudges, water, sweat, humidity, and even oils. It only comes off with a big splash of water [like in the shower or a pool], but won’t budge if you are caught in the rain. It also stays put throughout the sweatiest exercise routine and even in on oily skin. Because it can be kinda hard to remove, I only wear it in the summer when all other makeup melts off. benefit Cosmetics Gimme Brow ($24) – This used to be my go-to brow gel until it got recalled. Apparently, it can cause serious irritation when used as a mascara [not that I ever would], and there’s no ETA when it will be back in stock, if ever. Mirabella The Brow Shaper* ($20) – This brow gel is something between a tinted gel and a clear gel. It’s designed to help keep the brow hairs in place, but it also comes in one universal tint, so it’s not exactly suitable for literally everyone. I like it, but there are other products I would rather use instead. Lancome Sourcils Styler in Brun* ($26.50) – This is my current go-to product now that the 100% Pure tube is past its prime. I like how easy it is to use, and the shade Brun is a good match for my natural brow color. The only thing I am not a huge fan of is the weird shape of the brush – it has longer bristles on one side and shorter ones on the other so I have to rotate it for each brow. Anastasia Beverly Hills Beauty Express Palette in Brunette ($39.50) – I am embarrassed to admit just how old this palette is, so I’ll just leave it up to your imagination, lol. I love it, I truly do, and it’s absolutely amazing for beginners because it comes with stencils and everything one could possibly need to achieve the perfect brow. But it has to go. 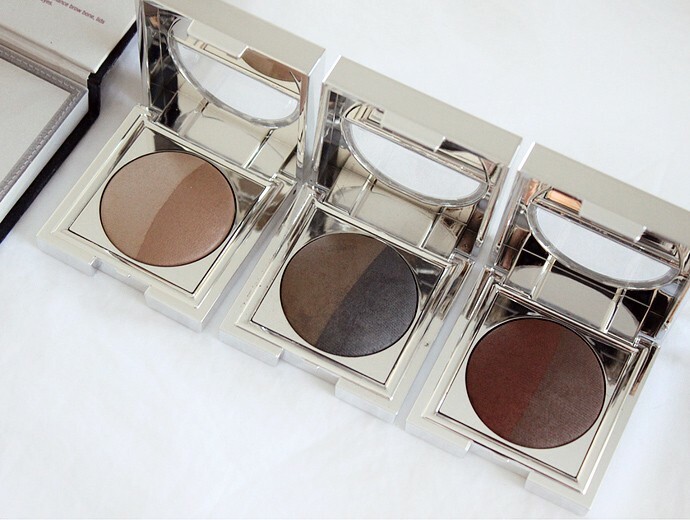 European Wax Center Browfection Brow Powder Duos* ($22) – These brow powders are exceptional, so no wonder they are used by professionals at EWC as part of your brow wax. The pans are gigantic and will last forever, plus, it’s a powder product, so it’s not likely to go bad for a long time. The survivors: Hourglass Arch Brow Sculpting Eyebrow Pencil, Lancome Sourcils Styler, blinc Eyebrow Mousse, ABH stencils, EWC Browfection Brow Powder Duos, EWC Ready. Set. Brow! Perfect Brow Groomer and PIXI Brow Tamer. I am actually glad that most of the brow products in my stash were due for a toss – that made it a whole lot easier to say good bye to some of my all-time favorites. I also tossed a few things that I can’t see myself using anytime soon. I change my hair color from time to time, and products that used to work with my previous shade, no longer look good now that my hair is darker and more cool-toned. With that said, I still kept a lot! First of all, I kept all three European Wax Center Browfection Brow Powder Duos. I sometimes do little makeovers for my family, and these will come in handy. I also saved ABH stencils from the Beauty Express palette, those are washable and easily reusable, so there’s no need to throw them away. For everyday use I kept one of the Hourglass Arch Brow Sculpting Eyebrow Pencils (Soft Brunette), Lancome Sourcils Styler, and blinc Eyebrow Mousse for summer, since it’s sweat-proof. I also kept EWC Ready. Set. Brow! Perfect Brow Groomer and PIXI Brow Tamer, because both are almost brand new and still in pristine condition. 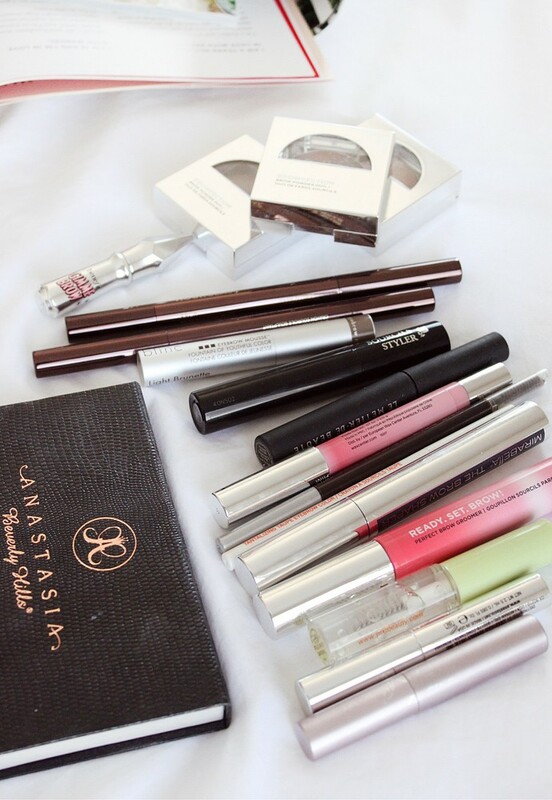 What’s your go-to brow product? Have you tried any of the products mentioned above? Let me know in the comments below!